There is always a judgment between wallpaper and paint, You may think that wallpaper is a relic of the past used only by some relative who hasn’t redecorated in decades. Now, wallpaper comes in high-grade quality and has special weather-resistant features that peeling is simply next to impossible! And the truth is that the trends in the wallpaper are back to the walls of the home. The biggest advantage of wallpaper has over paint is, you see what you get. If one selects a pattern of the wallpaper, you know that you're getting the exact same design on your wall. With paints, the color on the shade or color palette card might be much different from the final color that appears on the wall after the job is done. 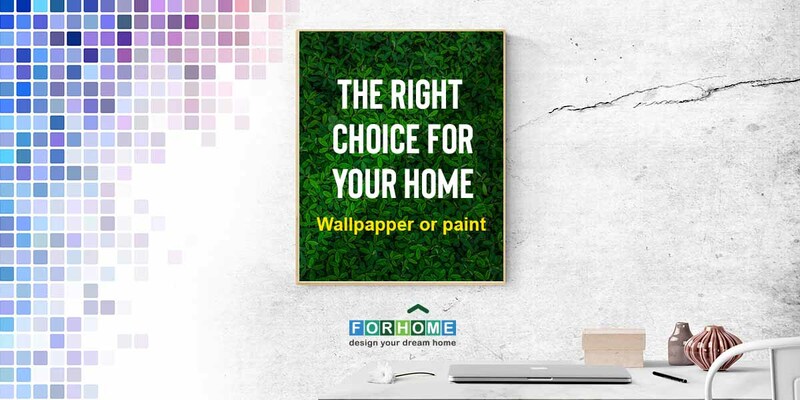 Wallpapers have the most customizable option, giving you the greatest range of options to accomplish exactly what you want which was the most advantage of wallpaper over paint. Wallpapers come in a tremendous array of designs and colors, with an incredible selection of beautiful effects like pearlescent finish, glitter, raised inks, suede, gels, beads, foils and metallics, embossed silk textures, and natural grass-cloth, just to name a few. Wallpaper provides a level of creativity you will not find with paint unless you hire someone to paint designs on your wall at a higher cost. New styles in wallpapers offer you today the look of faux suede, cork, velvet, vinyl, embossed finishes, textiles, and more. Using wallpaper for a room provides a level of versatility you just will not find with paint apart from the cost. Wallpaper can be customized to reflect your personal style and can create a feel from room to room with different designs and color schemes. With so many options to choose from, it’s easy to see why so many people are jumping on the wallpaper latest styles. The wallpapers offer exactly the same as you need At Forhome, we got every style, color, texture, and pattern you can imagine and need. Here we truly offer something fresh for everyone and with designer-inspired styles, you’ll love. When it comes to changing the interior of home or office, the question arises: " Paint the walls or paste the Wallpaper? What to do? ". If you want a home with something fresh and rare the wallpapers will better suits for you and your home. While the wallpapers will always have the uniqueness and freshness that you want! Painting is a solution for people who can't choose or decide on a color. Usually, wallpapers are for creative people who got special tastes and moods, Wallpapers are available at various colors and patterns as you like.